"Battle Your Way Past the Deadly Daleks,in a Spine-Chilling Race to Destroy Their Control Centre." The Daleks Are Everywhere, Moving and Evolving,With Sinister Stealth as They Hunt Their Enemies! You Can Actually Destroy the Dalek Control Centre - But Beware of the King Dalek! 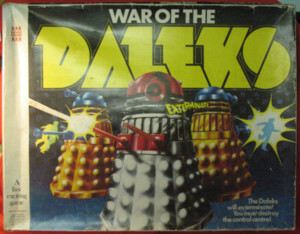 The Object of the Game is to Move Your Playing Piece to the Centre of the Board,and Destroy the Dalek Control Centre - But on the Way You Can Be Exterminated!! As the Dalek Control Piece is Moved the Daleks Patrol Along Their Tracks. When Landing on Certain Squares,You Then Control the Dalek Control Piece - Your Aim is to Exterminate Any Other Player. If the Dalek Exterminator Probe Touches an Opponent They Must Start Again. Gun Discs Are Used For Your Own Protection - and For Exterminating Daleks. When Play Reaches the Inner Track and the Last Inner Disc Space - The Cap is Lifted Off the Control Centre. If You Are Touched By the Panel With the King Dalek on the Back - You Are Exterminated and Must Start Again. If However Your Playing Piece is Touched by a Control Panel Section,With an Explosion on the Back,The Control Centre is Destroyed. Contents : 9 Daleks (5 Red/4 Blue),8 Gun Discs, 4 Playing Pieces With Stands, 4 Control Centre Pieces,1 Dice, 1 Centre Piece, 1 Playing Surface,1 Set of Rules.